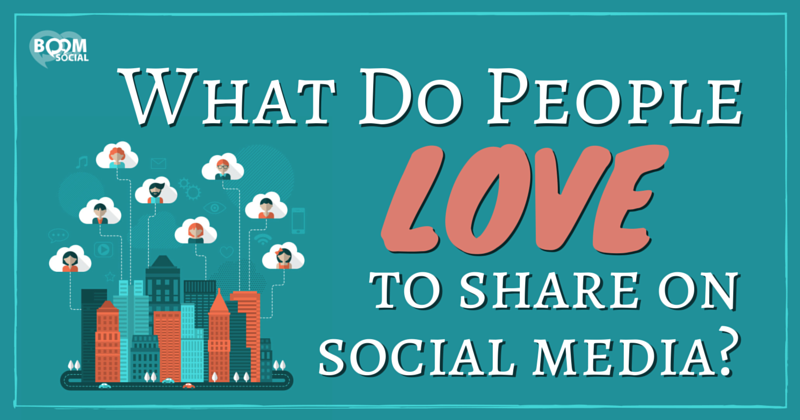 What Do People Love to Share on Social Media? Imagine if you knew exactly what types of content people loved to share on social media. This would give you an insider’s perspective on exactly how people use social networking sites, and what types of content YOU should share for maximum impact. Fortunately, this infographic by web design agency, Go-Gulf, reveals exactly what types of content get shared the most and who is doing all the sharing! So without further ado, here are the answers to the burning question: What do people love to share on social media! What are the most popular types of content people like to share on social media? Recommendations for stuff they like: books, movies, restaurants, etc. 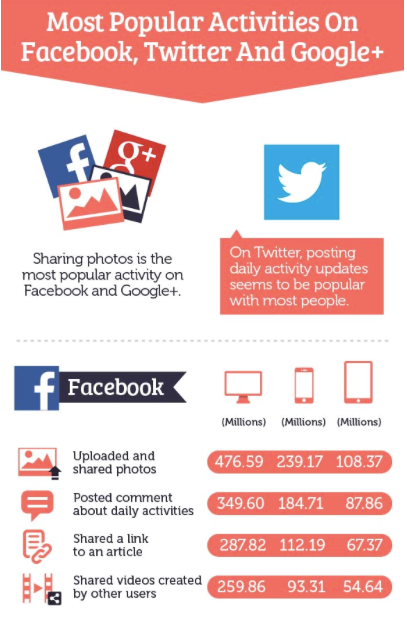 What are the most popular activities on social networking sites? If you had to guess what people are most likely to do on Facebook, Twitter and Google+, what would it be? Posting images? Playing games? Sharing links? What types of videos do people like to share? As I’m sure you’ve noticed, videos on social media are more popular than ever. In fact, in November, Mark Zuckerberg even predicted that in 5 years, most of Facebook would be videos! 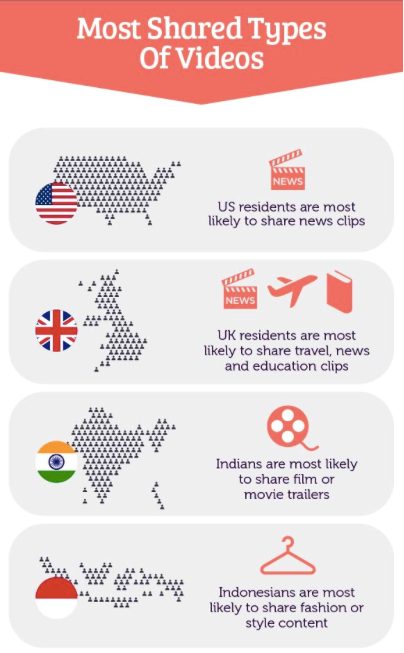 So, what types of videos do Facebook’s global users like to share? 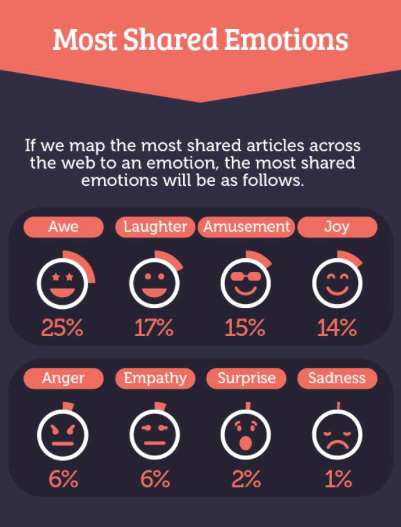 Which emotions are most likely to spur sharing? Takeaway: If you want people to share your content, focus on creating positive and uplifting stories and articles. Life is serious enough; your followers want you to provide some much-needed positivity! What’s the most popular type of content in the US? 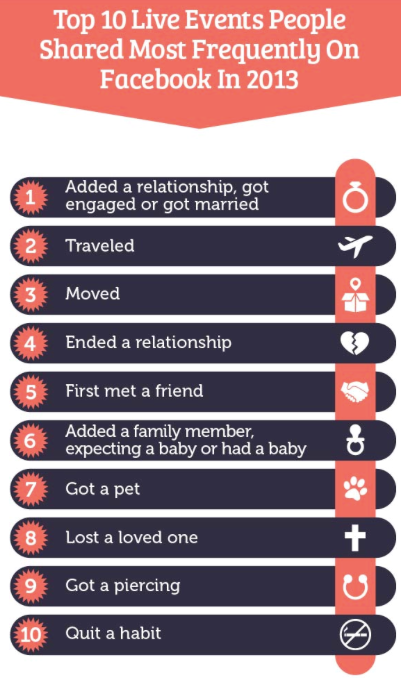 Which life events are most likely to get shared on Facebook? There’s no doubt that people LOVE to share exciting life events with their Facebook friends. But which events are users most likely to share? 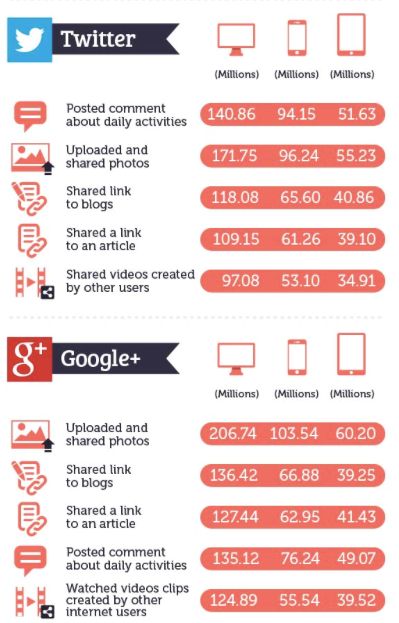 Who shares most on social media? You may already have some guesses, but this infographic may just surprise you. 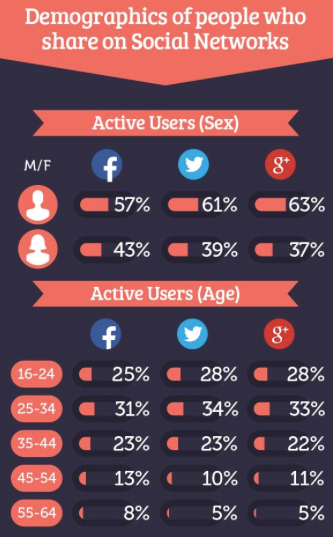 The users who are most likely to share on social media are……. In terms of age, 25-34 year olds share more than any other group. The next most active age group is 16-24 year olds. 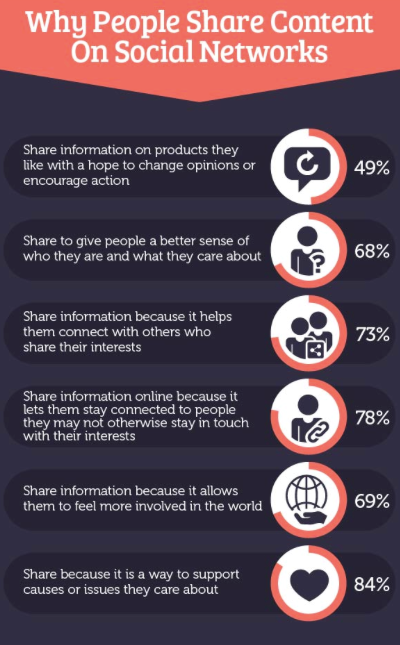 This infographic does a great job of summarizing what people love to share on social media, as well as WHO is doing all the sharing! Use these insights to inform and inspire your own social media content strategy! Were you surprised by any of the findings above? Share below! I’ve certainly had the most success with images but also things that people wouldn’t mind linking themselves too. What I mean by this is that things like quick tips are things people are happy to share as they feel they’re doing their own friends a service by letting them know about it. If a user feels they have benefited from your social media post then there’s a higher chance they’ll hit that share button. Im Very lucky to have you as a live Mentor through the human gift of Social Media…Im very excited whenever i See your updated post in twitter..im following your post for the last three days from India..I bookmarked almost all the pages….May god bless you to share knowledge like this often.. Interesting statistics, Kim. I started to think about it and yes, I instantly share posts on Facebook about causes that are dear to me, like finding forever homes for puppies, missing children alerts and if I like an image or a joke, I declare swipe time and post on my Wall or Page with attribution to the friend or Group member who posted it first. Interestingly, my male friends seem to post more spontaneously and that too about food and wine. Looks we are part of the norm! KIm- This was a really interesting infographic! It was no surprise that Americans shared humor and the UK shared travel and eductational information, but I had no idea MEN were the leaders in sharing content. That was revealing- and it may affect the content I post for sharing- maybe a more masculine background? I’am also glad you made this internationally focused as so much of what I do is global- it isn’t all about the USA these days for sure! Thanks again. I couldn’t have agreed more on all the points. Indeed, if you as a marketer knows what type of contents people love sharing on social media, you’ll really use that to your advantage. 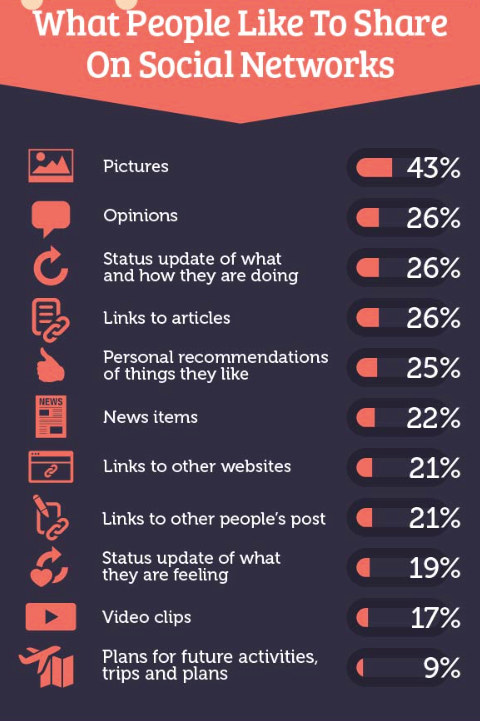 I too agree that people tend to share images and quotes the most these days especially on Facebook, image updates tends to be getting lots of engagement more than other types of content. I enjoyed the post man, thanks for sharing. I agree with all the points you outlined here. It’ll indeed be very helpful if you as a marketer knows exactly what type of contents your readers love sharing on the social media as this will enable you to give them what they want which will also boost your exposure. And yes, I’ve also noticed that images and quotes tends to get lots of engagement on Facebook and the other social media sites than the other types of contents provided the image is interesting and relevant. I really enjoyed the post Kim, thanks for sharing. Wowza. Great stuff. I like the way you presented it. Surprised my the gender stuff. I suppose if we were to toss Pinterest in here the numbers would change drastically. Love this Kim! Thank you! Interesting to see that Google + seems slightly skewed toward sharing links to blogs and articles than the other two. Thank you for all your research and effort. I appreciate all the useful information, especially for someone born B.C. We tend to share stuff that’s from the horses mouth we try not to share rumours or RIP’s we do our own sad ones unless it’s a high profile link with lots of info we share fun stuff and as a thank you we share what people have as their pinned tweet. We share stuff if its still newsworthy recently noticed how some links are really old which is a little annoying although sometimes still appropriate. we don’t get on with facebook really detest it but have it as we have to, facebook don’t seem to like us either lol so it sits there and waits for us. We like pinning & again often look for dates to make sure still current if in doubt we like rather than repost! Rambling on in the excitement of no 140 character constraints. Interesting stats. However, I find it annoying reading through them. For me, I would rather simply read them as bullet points or simply in a report. But like I said, interesting stats that should help anyone looking to make the most of their social media campaigns. This is great information as usual.I was very surprised to learn that men are the biggest sharers on social media.In my experience men love to share humorous posts the most so it was no surprise to see that statistic hasn’t changed. It’s always interesting to know such statistics. I guess that every user who do share every day can easily observe such statistics and of course in most of the cases he or she follows it either. If you want people to share your content, focus on creating positive and uplifting stories and articles. Life is serious enough. I enjoy sharing your articles. I love your unique voice. I think if one of your articles were given to me on plain white copy paper without anything to identify the source I would have a pretty good chance at picking it as your writing. Love the insight, always trying to gauge what our customers are doing online, and ensuring we have the right information on the right channels. I still feel that as the channel owners become more aware, they are wanting to push companies to pay for more and more promotions to moneterize their individual platforms to allow you message to be seen! These are some interesting statistics! This gives me some ideas of what to share, especially to build better connects with my social media peers. One thing I’m lacking in are showing photos. I think I need to do this more as well as videos. Thanks for the share Kim! Awesome statistics infographics and well explained. In this infographic one social platform is missing which is Instagram, though it is mobile apps but still it is very improtant social platform. Instagram is one of the growing platform now a days and so many companies are get into to get more social media peers and brand awareness. Very Interesting statistics, By understanding what people share, you can better assess your own content, and its ability to result in sustainable growth and traffic to your blog. The infographic uncovers an important opportunity for marketers who want to do a better job growing their audience. Great post as usual Kim. Kim- Do you know the source(s) for the data? I clicked on the agency link and I can’t find any info there. Chris, if you click on the full infographic link (http://www.go-gulf.ae/wp-content/uploads/2014/07/what-people-share-social-networks.jpg) then all the sources are at the bottom. Interesting findings….I knew about some while a few surprised me…especially the fact about men sharing most…Truly interesting! Look what nabanita just posted..It Does(not) Matter..